A multi-purpose electric frying pan for your kitchen! Use this special Presto 16-Inch Electric Skillet to roast, fry, grill, stew, bake, and perform other necessary cooking jobs for your meal preparation. Other features include the EverNu cover and Control Master heat control. 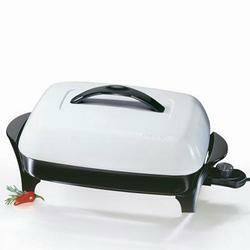 Multi-purpose electric frypan Roasts, fries, grills, stews, bakes under controlled heat. EverNu cover Will not dent, warp, peel, or bend. Dishwasher safe For easy cleaning, with heat element removed.